Realize a total return exceeding both the Russell 2000 Growth Index and the Russell Microcap Growth Index over a full market cycle. 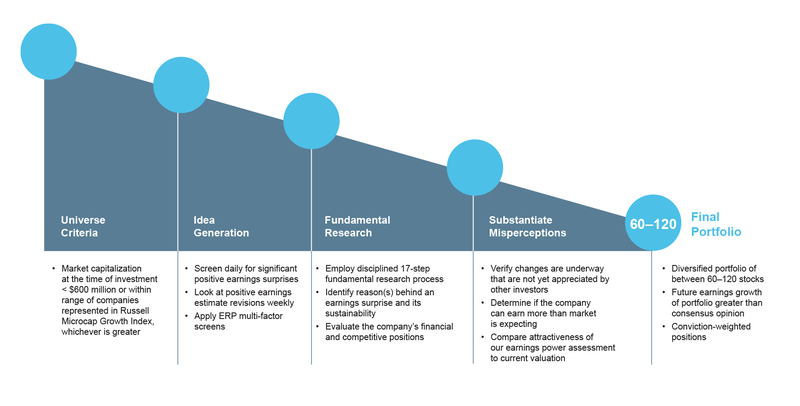 The Oberweis Micro-Cap Growth strategy seeks to capitalize on the exceptional growth potential of micro-cap companies that are often underfollowed or misunderstood by traditional Wall Street research analysts. The strategy invests in very small companies that, at the time of purchase, have a market capitalization of less than $600 million or are within the range of companies represented in the Russell Microcap Growth Index, whichever is greater. These companies often boast exciting products and/or services, a strong and sustainable competitive position, and the potential for upward revisions in earnings expectations in the future. Our fundamental research process is specifically designed to uncover such opportunities. Our process rests on our firmwide commitment to uncovering and capitalizing on the persistent and recurring stock pricing inefficiencies in micro-cap equities caused by a lag in investor response to new information. This lag in recognizing the catalysts likely to positively impact future earnings growth drives the security selection across all our strategies and mutual funds. The criteria used within each product, however, can differ. This is how our investment team implements our philosophy in the Micro-Cap Growth strategy. The Russell 2000 Index measures the performance of approximately 2,000 companies with small-market capitalizations. The Russell 2000 Growth Index measures the performance of those Russell 2000 companies with higher price-to-book ratios and higher forecasted earnings growth rates. The Russell Microcap Growth Index measures the performance of those Russell Microcap companies with higher price-to-book ratios and higher forecasted growth values. The Russell Microcap Growth Index is represented by the smallest 1,000 securities in the small-cap Russell 2000 Index plus the next 1,000 securities. Each index is an unmanaged group of stocks, the performance of which does not reflect the deduction of fees, expenses, or taxes. You cannot invest directly in these indexes. Advisory fees are disclosed in Part II of Form ADV. Performance is historical and includes the reinvestment of dividends and other income. Performance is calculated and presented in U.S. dollars. Past performance is not necessarily indicative of future results. Oberweis Asset Management, Inc. (OAM) claims compliance with the Global Investment Performance Standards (GIPS® standards). To receive a complete list and description of OAM’s composites and/or a presentation that adheres to the GIPS standards, contact Laura Dombro at 800-323-6166; write Oberweis Asset Management, Inc., 3333 Warrenville Road, Suite 500, Lisle, IL 60532; or e-mail laura.dombro@oberweis.net.